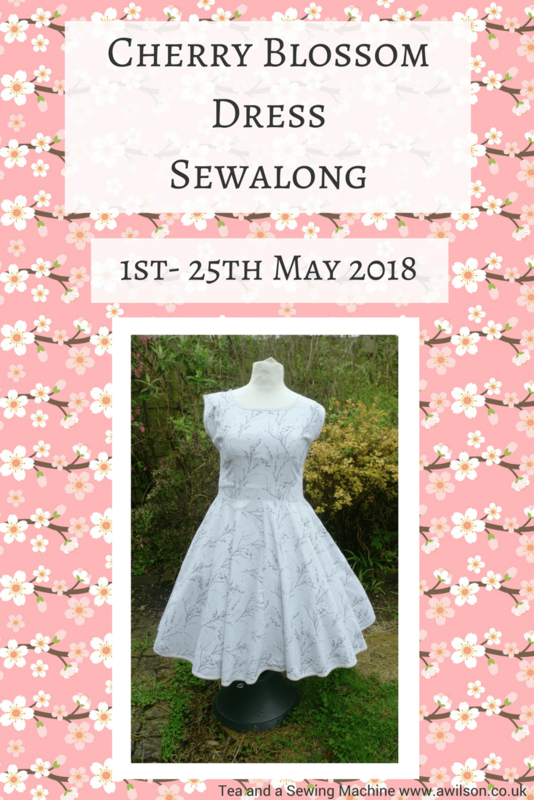 I’m so excited about Tea and a Sewing Machine’s first sewalong and I really hope you’ll want to join in! 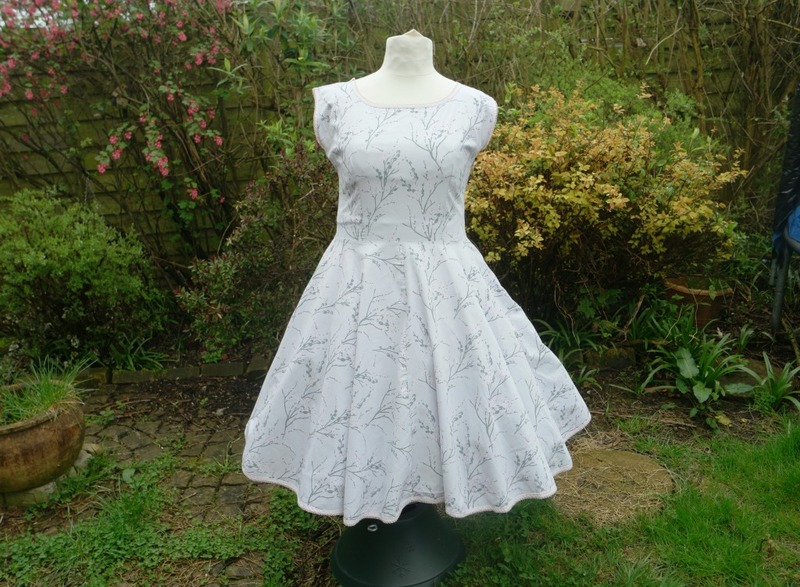 Starting on the 1st May, I’ll be walking you through making my Cherry Blossom Dress. There will be 8 installments, with a 2 posts a week, so it will run for 4 weeks. At the end of it, we’ll all have a finished dress! If you’ve never taken part in a sewalong before, don’t worry. This post will explain everything! What on Earth is a Sewalong? If you like sewing and you like blogs about sewing, you might have a picture somewhere in your head of a group of like minded people, all sitting together round a big table in a pretty house. People are sewing, drinking gallons of tea and there’s probably some cake too. Everybody’s friendly, kind and helpful. We turn up at the same time each week to work on the next stage of our sewing projects. A sewalong is the same, except that it happens in Internetland instead of at somebody’s house. Each week (in this case, twice a week), there’ll be a blog post explaining the next stage. Each stage will have clear steps and plenty of pictures. Hopefully there’ll be some videos as well and I’m going to give Facebook Live a go! I’ll be around in the comments and on Facebook to help if you get stuck, and we can all help each other. It’s great for people who find the idea of doing something all in one go overwhelming, either because of the time it might take or because it’s something that they’ve not tried before. What is a Cherry Blossom Dress? It’s this. Isn’t it pretty? It’s actually the second project in my ebook, Making Clothes Without a Pattern. Yes, that’s right, we’re not using a pattern. Don’t panic! It would probably be more accurate to say that we will be drafting the pattern pieces ourselves from out own measurements. This is one of the stages in the sewalong. The bodice is made from 2 pieces, which we will be drafting. The skirt is a circle, made from 4 quarter circles. You don’t need to make pattern pieces for this, just a little bit of maths, then we cut it out. Once the pieces are all cut out, sewing it all together is pretty straightforward. What Are the Steps Of the Sewalong? I’ve broken the whole process down into manageable chunks that could probably be achieved in an evening, or maybe 2 if you don’t have much time in the evenings. When Will The Steps Be Posted on Tea and a Sewing Machine? Starting on the 1st of May, the steps will be posted twice a week on Tuesdays and Fridays. The sewalong will run for 4 weeks, with the last step being posted on 25th May. How Much Sewing Experience Do I Need To Have? If you’ve never sewn anything before, you will probably find it too much. However, if you have some sewing experience, even if it’s not lots, you’ll probably be able to manage. The dress is fairly simple in its construction and I have a trick to make the zip easier! And everything being broken down into bite sized chunks will make things easier too. If you’ve made clothes before, it will help a lot and you’ll probably sail through without any trouble! It Sounds Like Fun. How Do I Take Part? The best thing to do is to sign up for the emails, which you can do by filling in this form. I won’t be clogging up your email every day, but I will send out a couple of reminders before it starts and and an email every time a new post goes live. I’ve also got some printables to help you with the sewalong, which I’ll send you when you sign up for the emails. There’s a checklist of what you need to do to get ready, a shopping list and a list of the steps so you can tick them off when you’ve done them. 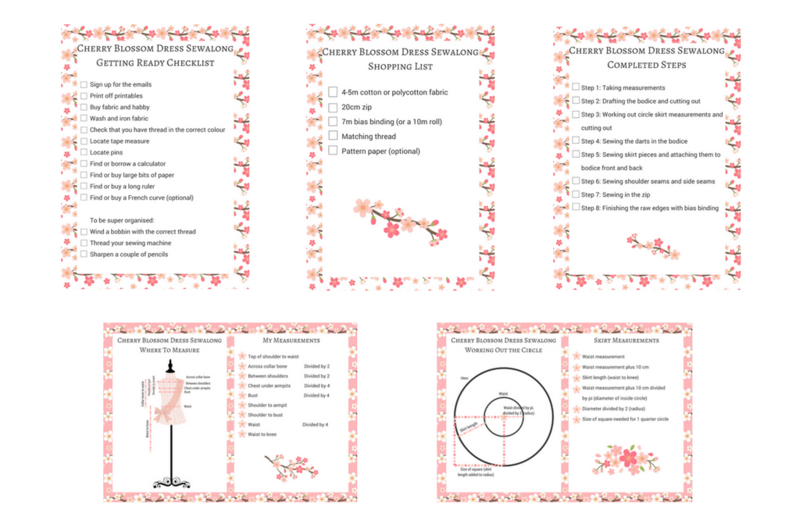 There’s also a printable for recording your measurements, and another one to help with working out the dimensions of the skirt. In addition to the usual sewing supplies, you’ll need cotton or polycotton fabric (4m should be enough for people who are a UK size 16 or smaller, otherwise you’ll need a bit more), a 20 cm invisible zip, 7m of bias binding (more if you’re bigger) and matching thread. You’ll also need some large sheets of paper. Pattern paper is ideal, but you could use newspaper or possibly greaseproof paper. A long ruler is useful, but you could make do with a tape measure. A French curve is handy too, but you could manage with a dinner plate if you don’t have a French curve and you don’t want to buy one. Sign up for the emails (the form’s nearer the top of this post)! If there’s anything you want to ask me about the sewalong, feel free! Either in the comments below, or you can email me at teaandasewingmachine@gmail.com. I found 4m of fabric 112 cm wide enough for a UK size 16. There’s somebody else planning to use a duvet cover too :). It’s the skirt that uses up the most fabric, so it’s making sure that there’s enough for the skirt, plus a bit for the bodice.